diana lynn's painting a day: Carnation, Lily, Lily, Rose. Another John Singer Sargent lesson. His "Carnation, Lily, Lily, Rose," painting captures a momentary twilight glow that is magical. 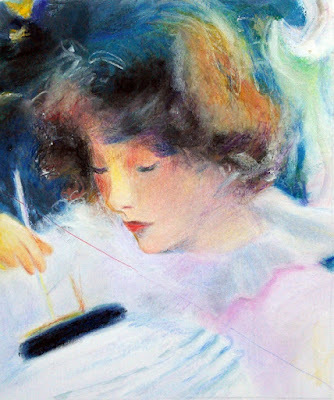 I cropped his original down to just this young girls face as she lights the paper lantern. My initial thought was to do Sargent's whole painting, but luckily, the Sane Me talked the Crazy Idea Me down from that ledge. I think my light areas could have used more middle tones and my face is not soft enough which make my girl look older than she should. "Good lesson," says the Sane Me.